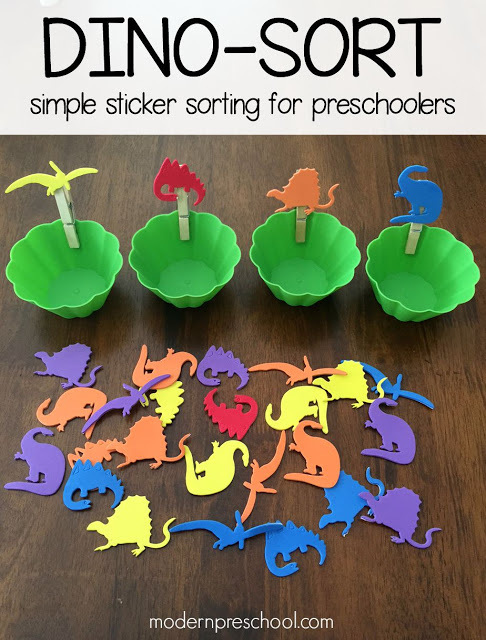 Sorting is a skill that preschoolers develop as they are exposed to different activities that work with visual discrimination over and over again. The great thing about sorting games and activities is that there are so many different options that little learners will never get bored with all the practice they are doing. 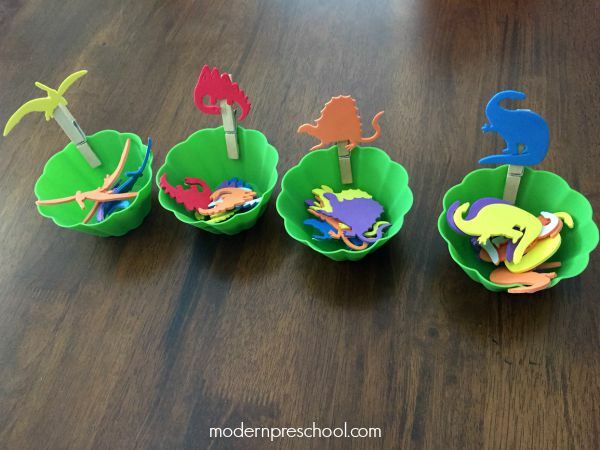 The dinosaur sticker sort is meant for an independent center in the classroom or as a fun busy bag activity at home! Remember that this activity is versatile! 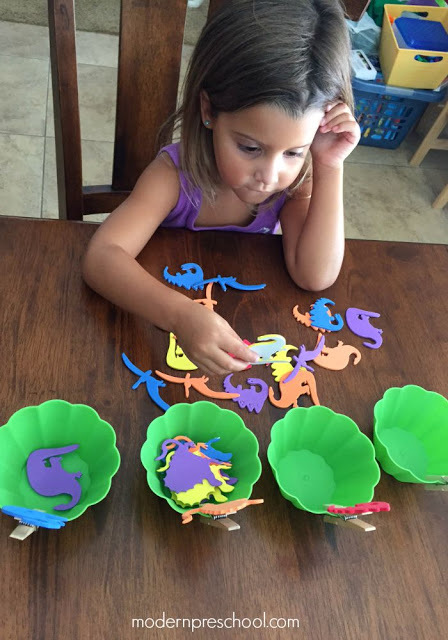 Change out the dinosaurs for flowers, fall leaves, alphabet letters, numbers, bugs…whatever stickers you have on hand will work. For my preschooler, I chose to have her sort by dinosaur and not color. At the beginning of the school year, I would have my 3’s sort by color and work up to by dinosaur type. Stick one dinosaur of each type onto a clothespin. Just peel the back off the sticker and stick it on. Attach one clothespin to each bowl. Spread the other dinosaur stickers out on the table or a tray. I use trays in my classroom as a simple way to separate table top centers. Do NOT take the backs off these stickers. 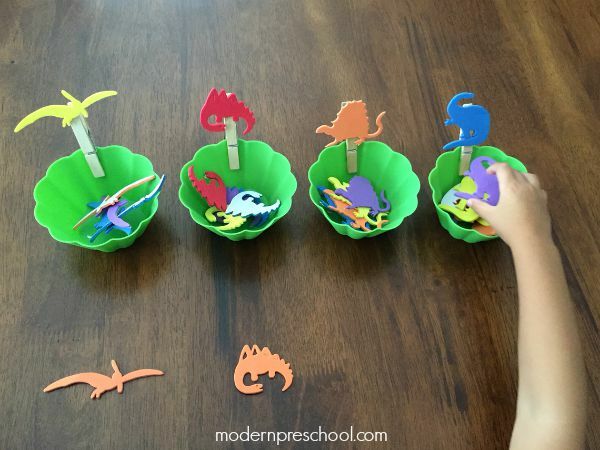 Each dinosaur sticker needs to be sorted into the correct corresponding bowls. This was tricky at first for my preschooler. She really, really wanted to sort them by color! 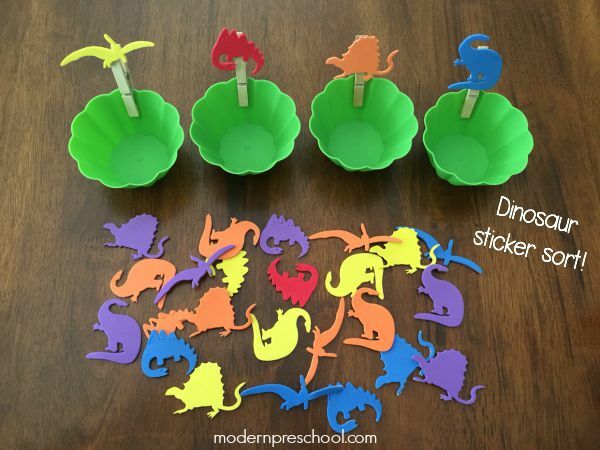 Once she caught on, she quickly sorted the dinosaurs into the bowls. She would hold up the sticker next to the dinosaur on the clothespin to double check herself. When she was done, she dumped the dinosaurs back out to play again! I’m a huge craft foam fan and use it as window stickers and reusable stickers on contact paper too! Need more simple learning ideas? Follow me on Pinterest!